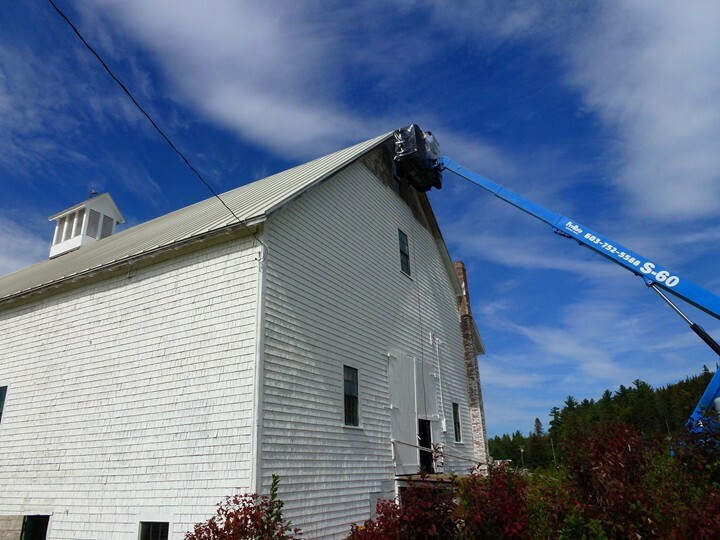 It has been another busy and productive summer for Maurice Lavertue and Donald Leclerc for the Brown Company Barns Restoration Project. This summer they repaired the large sliding door on the basement of the large barn to get it operating properly again. Replaced about 8 feet of sill on the North side of the barn, and installed 21 new windows on the basement level of the large barn that were partly funded with a grant from the Plum Creek Foundation. Finally, Maurice and Don painted the big barn which required 33 five gallon buckets of white paint. We thank them for their hard labor on this continuing project. 1. 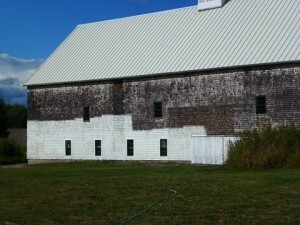 Minor structural work on the big barn (Maynesboro Stud Barn). 2. 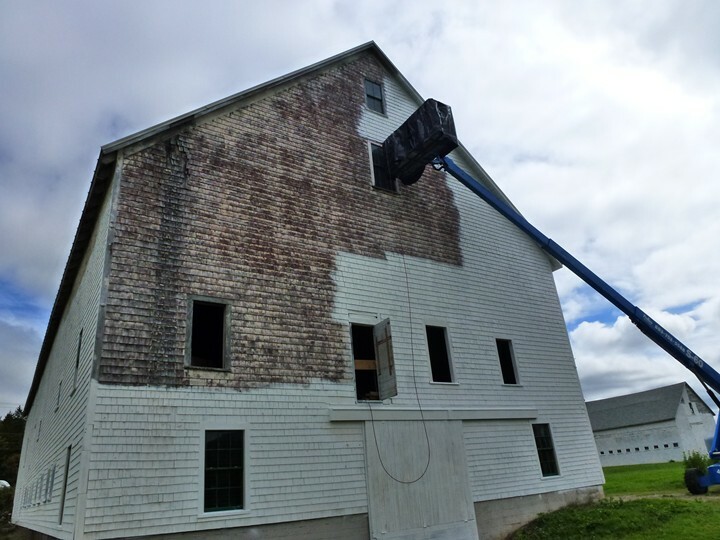 Replacement of the sill on the remainder of the small barn. 3. 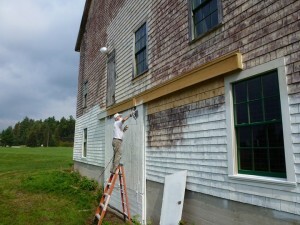 Paint the small barn. 4. Repair the windows on the small barn. OnMay 31, 2011, Turner Couture received his Eagle Scout badge for his project of beautifying the area around the Historic Brown Company Barns. Turner organized a group of fellow scouts and adults to accomplish this project. The area between the barns (about one acre) was very rough. Members of his group made the connections to have the area graded byWhite MountainLumber Co. and these volunteers raked the area to remove rocks, cleared brush, gave it the finishing touches that it needed, and planted grass. Last of all, with the help of Bruce Bunnell and Walter Nadeau, they built a 4’x 4’x18” protective stone wall around the Historic Marker located on the site. 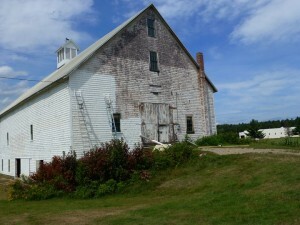 The ceremony was held in the large Brown Company Barn with about 50 people in attendance, followed by a reception. The Berlin & Coos County Historical Society congratulates Turner Couture for this great achievement and wishes him success in the future. 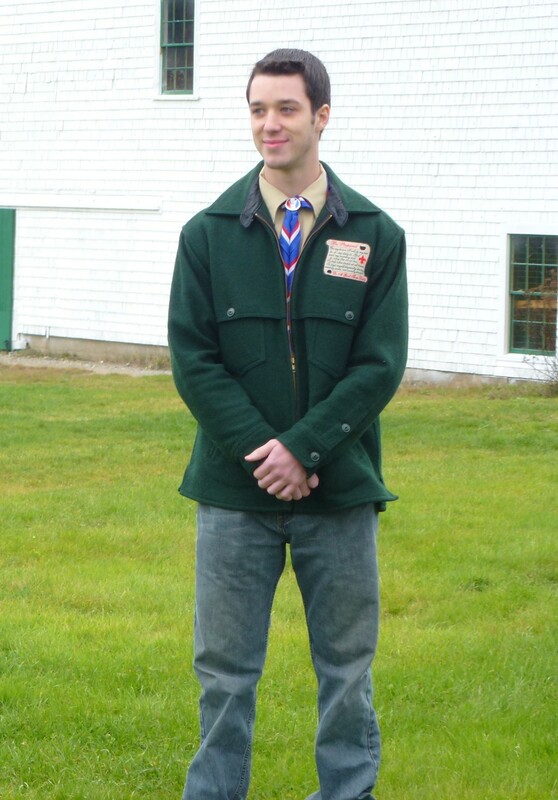 Recently, Turner was inaugurated as a Young Preservationist by the New Hampshire Preservation Alliance for his Eagle Scout project. He was among the “25 under 25” who have demonstrated a commitment toNew Hampshire’s heritage by helping to restore and revive a historic landmark and to inspire other preservation activity by young people under age 25. 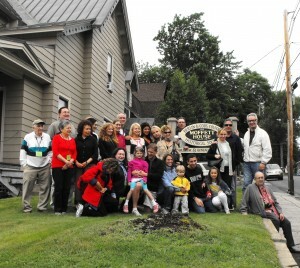 Of all the tasks we do at theGenealogyCenter, the most enjoyable is connecting families. For example, finding information for a person who, because of family circumstances, did not know anything about her Norwegian side of the family. When did they come over to this country? From where inNorway? Who they married and so on? Did they graduate from high school and where did they work? Because of the Berlin Directories and information we have painstakingly put into our computer, it is possible to find most of the answers. Another example; two ladies stopped by on their way home forOld Orchard Beach,Maine. They had family pictures they wanted to share with possible cousins who might still be living inBerlin. Through our information on the computer, we were able to connect them. With one phone call they connected with the local relatives and are now planning a reunion to look at old pictures and to share their stories. The most touching story to date was that of a young person trying to find his biological parents. We were not able to do this directly, but we connected him with a member doing genealogy on part of his family. The information the member was able to give him helped him find the rest of his family. Not all research requests are from walk-ins, however. We get online requests regularly. One such email was from a British Columbia family looking for their grandfather’s brother who was known to have settled inBerlin. The two brothers were separated when orphaned inEngland, have long been deceased and never saw each other again after their separation. Nevertheless, we were able to connect the descendants. And lastly, we were asked to fill in information on a family known to have passed through Berlin. On looking this up, we realized that they had cousins still living in Berlin. Two ladies ventured south from Quebec City to have lunch at the Northland Dairy Bar with a newly found cousin. They have made a date to get together again soon and pour over old, unidentified photos. Have you done your family tree? We would love to help you. Contact us by mail, telephone or email. Let’s see what we can find together! 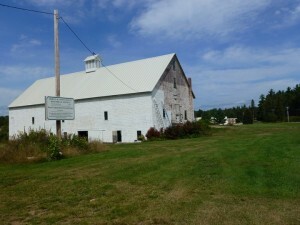 OnJune 25, 2011the Berlin & Coos County Historical Society hosted a reunion for the Abramson family. For the past year the Moffett House staff has been providing genealogical information to Phyllis Yawitt, the granddaughter of Nathan Abramson. Nathan settled inBerlinin about 1895, found it to be wonderful place to live and advised his family to come here fromEurope. The information given to Ms. Yawitt helped her to locate 450 relatives from all over the world. .After visiting the Moffett House, they all got on a bus and visited the Jewish cemeteries along with otherBerlinlandmarks having to do with their family. the newsletters on our web site go to www.berlinnhhistoricalsociety.org. E-mail contact is bcchs@hotmail.com. Admission is free. Because of the generosity of so many people, the museum has seen a great deal of growth since its establishment in 1997. To maintain this growth, financial aid is needed from various sources. Please remember the Society in your will and estate planning. Donations in memory of a loved one or direct contributions are received with appreciation. Gifts of artifacts and memorabilia are very important as well. We have a tax exempt classification of 501C3. 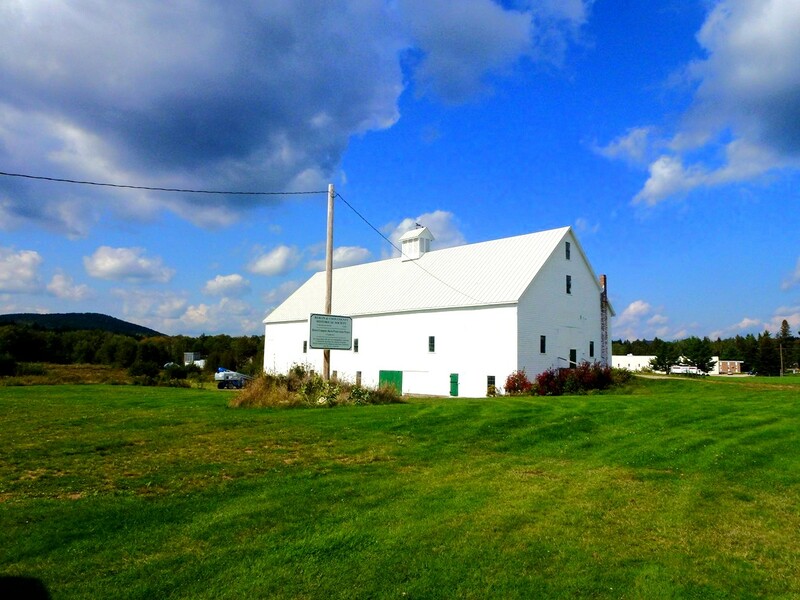 The Historical Society is a non-profit organization and it also relies on support through its membership dues. We sincerely hope you will remain a member by renewing your membership when it is due. If you are not already a member, we invite you to join to help support the preservation of the area’s rich heritage. The price for membership is $10.00 for individuals and $20.00 for family. The Moffett House has seen a steady increase of activities in the genealogy and records departments of the museum. Many people are coming in to research their roots as are organizations and groups doing research for historical documentaries and other projects. This year was our most successful year ever for sales at the barn. We hosted 6 sales and wish to thank all those who contributed to this funding event. All items sold were donated to us by generous members of the community. Our appreciation also goes to the volunteers who unselfishly gave of their time. 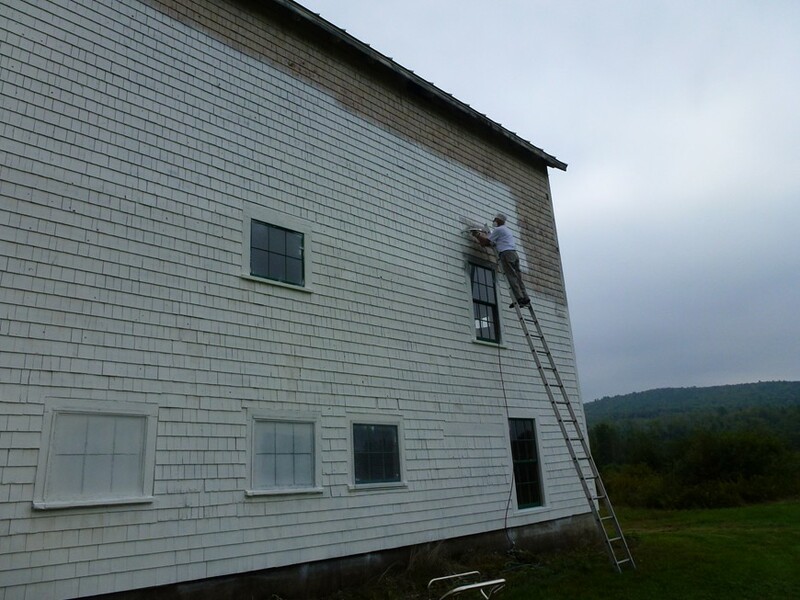 These funds help defray the expenses of heating the museum, thus enabling it to remain open year round.